This article is about the industry body. For the PCMCIA card format, see PC Card. The Personal Computer Memory Card International Association (PCMCIA) was a group of computer hardware manufacturers, operating under that name from 1989 to 2009/2010. Starting with the eponymous PCMCIA card in 1990, it created various standards for peripheral interfaces designed for laptop computers. The PCMCIA (Personal Computer Memory Card International Association) industry organization was based on the original initiative of the British mathematician and computer scientist Ian Cullimore, one of the founders of the Sunnyvale-based Poqet Computer Corporation, who was seeking to integrate some kind of memory card technology as storage medium into their early DOS-based palmtop PCs, when traditional floppy drives and harddisks were found to be too power-hungry and large to fit into their battery-powered handheld devices. When in July 1989, Poqet contacted Fujitsu for their existing but still non-standardized SRAM memory cards, and Intel for their flash technology, the necessity and potential of establishing a worldwide memory card standard became obvious to the parties involved. This led to the foundation of the PCMCIA organization in September 1989. By early 1990, some thirty companies had joined the initiative already, including Poqet, Fujitsu, Intel, Mitsubishi, IBM, Lotus, Microsoft and SCM Microsystems. 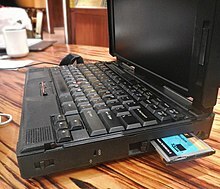 From 1990 onwards, the association published and maintained a sequence of standards for parallel communication peripheral interfaces in laptop computers, notably the PCMCIA card, later renamed to PC Card, and the ExpressCard (2003), all of them now technologically obsolete. The PCMCIA association was dissolved in 2009 and all of its activities have since been managed by the USB Implementer's Forum, according to the PCMCIA website. ^ a b c d e f g h Strass, Hermann (1994). PCMCIA optimal nutzen [Using PCMCIA optimally] (in German). Franzis-Verlag GmbH, Poing. ISBN 3-7723-6652-X. 9-783772-366529. ^ Mielke, Bernd (1997). PC-Card Anwender-Lösungen [Solutions for PC Card users] (in German). Franzis-Verlag GmbH, Feldkirchen. ISBN 3-7723-4313-9. 9-783772-343131. ^ USB Implementers Forum (ed.). "USB-IF Announces Intent to Acquire PCMCIA Assets" (PDF). Retrieved 2016-08-10. "The Official PCMCIA Association Website". Personal Computer Memory Card International Association. Archived from the original on 2008-12-25. Retrieved 2016-08-14. This page was last edited on 26 December 2018, at 21:56 (UTC).